I hope that this article will help those who may be having trouble with making good quality compost. It comes to us by way of Organic Gardening. Nothing is worse than cold, slimy compost! How does it get this way? Three factors are usually to blame: poor aeration, too much moisture, or not enough nitrogen-rich material in the pile. A compost pile overburdened with materials that mat down when wet—grass clippings, spoiled hay, heaps of unshredded tree leaves—can become so dense that the pile's center receives no air. If you leave such a suffocating heap uncovered during a prolonged rainy spell (and don't turn it to introduce some air into the center), you'll end up with a cold, soggy lump that just sits there. Aerobic bacteria—the tiny microorganisms that make compost cook—cannot live in such an oxygen-poor environment. What you instead make welcome in such a pile are anaerobic bacteria, which don't require air to thrive. These microbes will eventually make compost, but they work much more slowly than aerobic bacteria and the compost will be slimy and soggy during the long (about 2 or 3 years) process. This would be no big deal for a patient gardener, but an anaerobic compost pile makes a lovely home for sow bugs, pill bugs, and earwigs—all undesirables. And you can be sure that such a pile won't get hot enough to kill any weed seeds it contains, either. Fortunately, soggy compost is fairly easy to fix. If relentlessly wet weather is part of the problem, place a loose-fitting lid or tarp over the pile. You'll also need to turn the pile over and fluff it up thoroughly. If you have some "hot," nitrogen-rich ingredients (like shellfish shells) and fibrous, nonmatting ingredients (like shredded corn cobs or sawdust), add them to help get things cooking. Your pile should heat up within a few days, after which you can keep it cooking by turning it every week or two. Chances are, you live in the West, meaning that you are probably a little dry and dusty, too! This is quite common from May to October in areas where summer rainfall is practically nonexistent. No matter what materials you pile up, the stack just doesn't get enough moisture to support the bacterial life necessary to fuel the composting process. Luckily, curing dry and dusty compost is as simple as turning on a spigot. That's right, water it! Here's a rule of thumb you can rely on: Your compost ingredients should feel about as wet as a damp sponge when they're in the pile. Put an oscillating sprinkler on top of your dry compost pile and run it for an hour—this will moisten the materials better than running an open hose on top. After sprinkling, check the center of the pile to be sure it's moist—sometimes you'll need to turn the pile and water the layers as you go. Turning and watering your dormant pile should bring it to life quickly. If it doesn't heat up, it might lack nitrogen-rich materials. If that's the case, tear the whole thing apart, add some manure or bloodmeal to get it going, and pile it up again. And once the pile does start cooking, don't let it dry out again. As they multiply, those tiny microorganisms use up a lot of water. You may have to water your compost almost as often as you water your roses during a heat wave! Sow bugs won't harm your compost—in fact, they're actually helping to break it down. But if you don't remove them from the finished mixture before you spread it on the garden, you might find them snipping off the emerging roots and leaves of your beans, beets, and other seedlings. Ants and earwigs also invade compost piles. Like sow bugs and pill bugs, they are essentially harmless to the composting process, but their presence may indicate that your pile is on a slow track to decomposition. To get these bugs out of your compost, raise the heap's temperature to above 120°F. (If you aren't sure what your pile's temperature is, measure it with a compost thermometer or a regular old meat thermometer wrapped in plastic.) Turn the pile over and rebuild it, watering it well as you go. 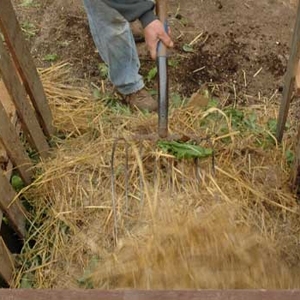 If it contains lots of leaves or straw, mix in a nitrogen source like bloodmeal, manure, or shellfish shells. It should start heating soon, and when it does, those bugs will depart for a more comfortable place. To keep your pile cooking, turn it at least every 2 weeks; more often if possible. But what if your finished compost is infested with sow or pill bugs and you want to use it where seedlings are growing? Do you have to start all over again? No. Spread the compost in a thin layer on a tarp in direct sunlight and leave it there to dry. The bugs will bail out quickly. Even a hot compost pile doesn't always heat up enough to kill all the weed seeds it contains. The heat causes weed seeds or even volunteer vegetables (tomatoes, pumpkins, etc.) to sprout. If the plants are truly weeds, just pull them up and toss them back into the unfinished compost. On the other hand, if the plants are volunteers you want to keep, feel free to transplant them to your garden. If your pile emits the sharp, nose-twisting stench of ammonia, it contains too much nitrogen-rich material (raw manure containing lots of urine is the likely culprit); it may also be too wet to allow aerobic bacteria to thrive. If it just "smells rotten" and lots of flies are hanging around it, you've most likely added large loads of kitchen scraps or canning wastes to the pile without chopping or mixing them in thoroughly. In either case, you should remake the heap to bring your stinky compost under control. If you have added manure and stable bedding to your pile, mix in some absorbent and slow-working materials such as chopped straw or shredded tree leaves. The pile should start to heat up quickly, and once it gets going, it will smell just as sweet as compost can. If kitchen scraps, canning waste, or similar large amounts of mucky stuff are producing offensive odors, turn the pile without adding anything, and be sure to break up all the mucky stuff and mix it in well as you go. In the future, you can avoid this unpleasant task by first finely chopping up such material and mixing it thoroughly into the heap, where it won't come back to haunt you. Actually, raccoons (...or opossums or dogs or skunks or rats or bears or...) do not eat compost; they tear up the pile to get at any fresh, edible kitchen garbage (especially if you risked adding "forbidden" meat scraps or fat) that you recently buried. Mixing kitchen garbage with soil or wood ashes before burying it (in the hot center of your pile) might discourage animals from trying to reach the hidden goods to begin with. But once such scavengers have gotten used to visiting your heap for a free meal, your best bet is to build or buy a covered bin (go for an off-the-ground model, such as the Compost Tumbler, if you can) to keep the garbage hounds away. Most experts will tell you that a hot compost pile should be turned at least twice a month and as often as twice a week to keep it cooking away at that ideal 150°F. Too few of us have the time and energy to work that hard and often on composting. You may also not have enough materials on hand all at once to build a hot pile, which needs to be about 3 by 3 by 3 feet to start with. Ensure complete breakdown of the materials that go into your pile by shredding and mixing everything before piling it up. Run a lawn mower over it all, use pruning shears to cut up big stuff, like coarse, stems and stalks, or put everything through a chipper/shredder, if you can. If that's not possible, build the pile in layers—alternating "brown" (carbon-rich materials like leaves and straw) and "green" (nitrogen-rich materials like grass clippings and garbage) components, mixing them together as you go. In either case, try to include some finished compost or rich topsoil in the mix to introduce those all-important beneficial bacteria to the pile. And remember to water your pile well as you build it. Keep the moisture content as even as possible (if it dries out, give the compost a soaking with the sprinkler). That's it.